The purposes of this web site are to complement and enlarge upon the documentary, Courting Justice. The context of the film is South Africa’s transformation from apartheid to a human rights-based constitutional democracy. Courting Justice features seven of South Africa’s women judges who, as judges, are charged with advancing that transformation. They tell “their stories,” speaking to us in their court rooms, chambers, homes and the communities in which they lived during apartheid. In telling their stories they convey their deep commitment to creating a human rights jurisprudence and bring attention to the importance of the judiciary’s engagement in realizing the constitution’s promises. They also provide insight into the judiciary’s own transformation — a necessary condition for the judiciary’s legitimacy and effectiveness. 2012 promises to be a busy year for Courting Justice. South Africa's Ambassadors, High Commissioners and Consul Generals in more than twenty countries are planning screenings and in South Africa the amazing Gold Museum has been offered as a venue. South Africa's High Commissioner to Canada is hosting the screening to be shown at the Ottawa Public Library. February 1, 5:45 PM Main Auditorium , 120 Metcalf Street. In San Francisco, California's Admin Office of the Courts—"AOC: 50 years of service to the courts and the people of California, 1961–2011" --is hosting the screening. February 7, 11 AM – 12:30 PM, Lower level auditorium, 455 Golden Gate Avenue. Also in San Francisco, the University of California/San Francisco will be the venue for a screening. February 9, 6pm Mission Bay Campus. Deutsche Bank in New York City is host to a screening. The Honorable William G. Ford, Judge of the Suffolk County District Court is host to the screening at the Suffolk County Bar Association. "Courting Justice," he comments, " shows the importance given by the South African government and its citizens to the rule of law and to theirshared heritage. It speaks to their faith in a civil society, as governed by a written Constitution." Linda Greenhouse,Yale Law School and former New York Times Supreme Court reporter "Courting Justice" documents in a most gripping way the role that women in the judiciary are playing in building the new South Africa. I found these women's stories touching and inspiring. Charles J, Ogletree, Jr., Jesse Climenko Professor of Law, Founding and Executive Director, The Charles Hamilton Houston Institute for Race and Justice The film stands as a vivid testament to the central role of diversity in a healthy democracy. By documenting as it does the role of women in the forefront of the administration of justice at every level of the South African society, it is also a testament to South Africa’s determination to realize the promise of its remarkable constitution. All of this is conveyed in the most compelling terms. This film will be… particularly useful in generating discussion of the complex relationship between race and gender in a judicial context as well a social movement context. Carolyn Turner, Senior TV Producer, Voice of America This is an inspirational film, especially for young people with aspirations. It is a revelation to go behind the scenes for intimate glimpses of women judges to see how meticulous they are in weighing the social and individual consequences of their judgments and interpretations of the law. The score by Philip Miller transports you to the time and place and you can feel the transformation this culture has witnessed. The spontaneous singing choir in the Court at the Political Prisoners Commemoration captures that unmistakable South African sound that reflects the pure joy of freedom. The score should be made available as a separate CD. Roberta I. Shaffer, the Law Librarian of Congress (Library of Congress) "Courting Justice" tells many stories--the struggle of a nation to build a credible judiciary; the journey of a small group of women judges who agree to serve as role models in the courtroom, classroom and at home for a new generation; and the universal lesson that passion and perseverance can overcome almost all challenges. 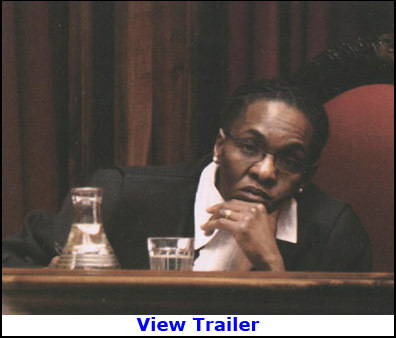 Through the camera's eye and with a compelling musical score, we are captivated as women from a wide variety of starting points don judicial robes and assume a shared "bench" to transform a nation, in this case South Africa, through the rule of law. Courting Justice has been shown at The United Nations, Embassies and Consulates, U.S. Department of State, South Africa Parliament, Library of Congress, Woodrow Wilson International Center for Scholars, and the Law and Society Association.